By far the most discussed event on Italy's art calendar this year is Christo's “Floating Piers” installation on Lake Iseo running from June 18th to July 3rd. This massive project is a series of floating golden walkways where visitors can stroll above the surface of the lake from the town of Sulzano to the tiny islands of Monte Isola and San Paolo. Lake Iseo is an easy trip from Milan, so join the expected half a million visitors to see this unique event if you are in northern Italy this June. Another huge yet ephemeral outdoor work making headlines in Italy this year is South African artist William Kentridge's "Triumphs and Laments", a sprawling mural covering a half kilometer stretch of the Tiber River retaining wall in Rome which will be unveiled in April, though portions of it are already completed and on display. The mural, which depicts Italian figures from Roman emperors to modern figures like Pier Paolo Pasolini, is created with oversized stencils and power-hoses, which wash away the decades of grime around the shapes and leave the shadow-puppet outline of the artist's charcoal sketch behind. 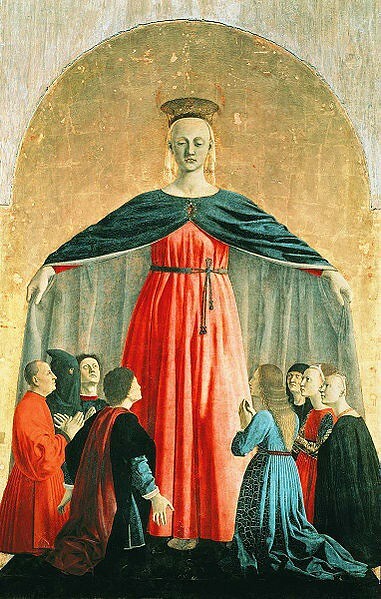 In what promises to be an extraordinary event, both in scope and theme, the “Piero della Francesca: Investigation of a Myth” show running from February 13 to June 26 at the San Domenico Museums in Forlì, gathers a rare collection of works from this early Renaissance master (http://www.ciuitaly.com/blog/files/piero-della-francesca-trail.php) and compares them to those of modern artists. This 15th-century painter, along with contemporaries like Domenico Veneziano, Fra Angelico, and Paolo Uccello, had a lasting influence on much later masters like Degas, Cezanne, De Chirico, Balthus, and Hopper, which will be fascinating to see as works by the former and latter groups are hung side by side. In an exhibition that will please Venetian history buffs, lovers of the Renaissance, and bibliophiles, Venice's Galleria dell'Accademia is hosting “Aldus Manutius: The Venice Renaissance” from March 19 to June 19. This exhibition illustrates how Aldus Manutius ushered in the era of the modern book and made Venice the capital of book printing by founding the Aldine Press in the early 1500's. Drawings and engravings by fellow humanists and artists Giorgione, Bellini, Cima da Conegliano, Titian, and Lotto will be displayed alongside early printed books. If you are visiting Milan before June 5th, stop in to see “Symbolism: From the Belle Epoque to the Great War” in the Palazzo Reale. This late 19th century art movement is known for its dreamlike and metaphorical compositions, a reaction to the gritty realism and naturalism that had preceded it, and the works of Ensor, Moreau, Redon, and Bocklin from the late 1800's and early 1900's explore the mystical and mythological. From Europe to Detroit, and back again. Genoa's “From the Impressionists to Picasso” in the Palazzo Ducale until April 10th shows works from the Detroit Institute of Arts, one of the most important collections in the US covering Impressionism to the avant-gardes. The exhibition focuses on Renoir, Cézanne, and Picasso, but also includes works by Van Gogh, Matisse, Monet, Modigliani, Degas, Monet, Manet, Courbet, Otto Dix, Degas, Gauguin, and Kandinsky. The “Matisse and His Times” exhibition until May 15th in Torino was organized with the Centre Pompidou and includes hundred of masterpieces of this French artist and his contemporaries, including Picasso, Braque, Renoir, Miró and Modigliani. The works trace Matisse's career from his beginnings at Moreau’s atelier and demonstrate how this group of artists influenced each other and evolved into the Modernist movement. Florence is covered with posters advertising Palazzo Strozzi's “From Kandinsky to Pollock”, an important showing of works from the Guggenheim collection in New York which ends on July 24th and which has become one of the most popular exhibitions of 2016. Works from modern European artists including Marcel Duchamp, Max Ernst, and Man Ray are included, as well as sculptures and paintings by Pollock, Rothko, Calder, and Lichtenstein.